Every fiscal statue makes provision for determination of value as tax is normally payable on ad-valorem basis. In GST also, tax is payable on ad-valorem basis i.e. percentage of value of the supply of goods or services. Section 15 of the CGST Act and Rule 27 to Rule 35 of CGST Rules, 2017 ( Chapter IV – Determination of Value of Supply), contain-provisions related to valuation of supply of goods or services made in different circumstances and to different persons. Under GST law, taxable value is the transaction value i.e. price actually paid or payable, provided the supplier & the recipient are not related and price is the sole consideration. In most of the cases of regular normal trade, invoice value will be the taxable value. However, to determine value of certain specific transactions, Determination of Value of Supply rules have been prescribed in CGST Rules, 2017. 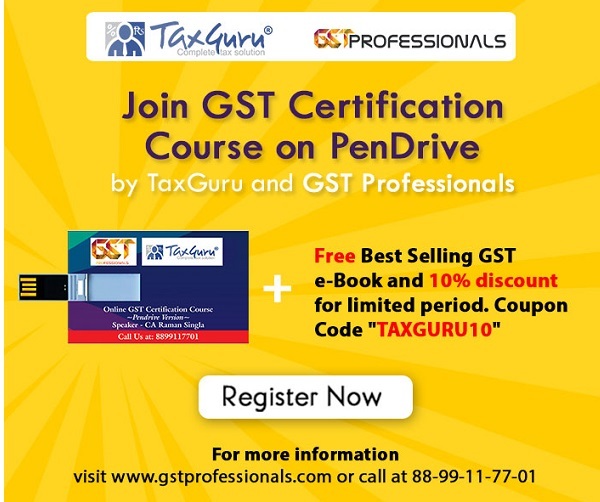 Any taxes, fees, charges levied under any law other than GST law, expenses incurred by the recipient on behalf of the supplier, incidental expenses like commission & packing incurred by the supplier, interest or late fees or penalty for delayed payment and direct subsidies (except government subsidies) are required to be added to the price (if not already added) to arrive at the taxable value. Discounts like trade discount, quantity discount etc. are part of the normal trade and commerce, therefore pre-supply discounts i.e. discounts recorded in the invoice have been allowed to be excluded while determining the taxable value. Discounts provided after the supply can also be excluded while determining the taxable value provided two conditions are met, namely – (a) discount is established in terms of a pre supply agreement between the supplier & the recipient and such discount is linked to relevant invoices and (b) input tax credit attributable to the discounts is reversed by the recipient. i. Open Market Value of such supply. ii. Total money value of the supply i.e. monetary con-sideration plus money value of the non-monetary consideration. iii. Value of supply of like kind and quality. iv. Value of supply based on cost i.e. cost of supply plus 10% mark-up. Open Market Value means the full value in money excluding taxes under GST laws, payable by a person to obtain such supply at the time when supply being valued is made, provided such supply is between unrelated persons and price is the sole consideration for such supply. Supply of like kind & quality means any other supply made under similar circumstances that is same or closely resembles in respect of characteristics, quality, quantity, functionality, reputation to the supply being valued. (1) Where a new phone is supplied for Rs. 20000/- along with the exchange of an old phone and if the price of the new phone without exchange is Rs.24000/-, the open market value of the new phone is Rs 24000/-. (2) Where a laptop is supplied for Rs. 40000/- along with a barter of printer that is manufactured by the recipient and the value of the printer known at the time of supply is Rs. 4000/- but the open market value of the laptop is not known, the value of the supply of laptop is Rs. 44000/-. Value of supply between distinct and related persons (excluding Agents). ii. Value of supply of like kind and quality. iii. Value of supply based on cost i.e. cost of supply plus 10% mark-up. However if the recipient is eligible for full input tax credit, the invoice value will be deemed to be the open market value. It has also been provided that where the goods being supplied are intended for further supply as such by the recipient, the value shall, at the option of the supplier, be an amount equivalent to 90% of the price charged for the supply of goods of like kind and quality by the recipient to his unrelated customer. a) Open market value of goods being supplied, or, at the option of the supplier, 90% of the price charged for the supply of goods of like kind and quality by the recipient to his unrelated customer. Where a principal supplies groundnut to his agent and the agent is supplying groundnuts of like kind and quality in subsequent supplies at a price of Rs. 5000/- per quintal on the day of supply. Another independent supplier is supplying groundnuts of like kind and quality to the said agent at the price of Rs. 4550/- per quintal. The value of the supply made by the principal shall be Rs. 4550/- per quintal or where he exercises the option the value shall be 90% of the Rs. 5000/- i.e. is Rs. 4500/- per quintal. i. Value of supply based on cost i.e. cost of supply plus 10% mark-up. Subject to fulfilment of certain conditions, the expenditure and costs incurred by the supplier as a pure agent of the recipient of supply of service has to be excluded from the value of supply. Corporate services firm A is engaged to handle the legal work pertaining to the incorporation of Company B. Other than its service fees, A also recovers from B, registration fee and approval fee for the name of the company paid to Registrar of the Companies. The fees charged by the Registrar of the companies registration and approval of the name are compulsorily levied on B. A is merely acting as a pure agent in the payment of those fees. Therefore, A’s recovery of such expenses is a disbursement and not part of the value of supply made by A to B. Methods to determine Taxable value of following five specific supplies have also been prescribed under valuation Rules. These can be used by the supplier if he so desires. Taxable value is difference between buying rate or selling rate of currency and RBI reference rate for that currency at the time of exchange multiplied by total units of foreign currency. However if RBI reference rate for a currency is not available then taxable value is 1% of the gross amount of Indian Rupees provided/received by the person changing the money. Taxable value will be 1% of the lesser of the two amounts the person changing the money would have received by converting (at RBI reference rate) any of the two currencies in Indian Rupees. One percent of the gross amount of currency exchanged for an amount up to one lakh rupees, subject to minimum amount of two hundred and fifty rupees. One thousand rupees and half of a percent of the gross amount of currency exchanged for an amount exceeding one lakh rupees and up to ten lakh rupees. Five thousand rupees and one tenth of a percent of the gross amount of currency exchanged for an amount exceeding ten lakhs rupees subject to a maximum amount of sixty thousand rupees. Taxable value is 5% of basic fare in case of domestic travel and 10% of basic fare in case of international travel. Basic fare means that part of the air fare on which commission is normally paid to the air travel agent by the airline. The expression ‘basic fare’ means that part of the air fare on which commission is normally paid to the air travel agent by the airlines. Where policy has dual benefits of risk coverage and investment – Taxable value is gross premium charged less amount allocated for investments or savings if such allocation is intimated to the policy holder at the time of collection of premium. Single premium annuity policy where allocation for investments and savings is not intimated to the policy holder – taxable value is ten percent of the single premium charged from the policy holder. Other cases- Twenty five percent of premium charged from the policy holder in the first year and twelve and a half percent of premium charged for subsequent years. However, where insurance policy has benefit of risk coverage only, then taxable value is entire premium charged from the policy holder. The taxable value of supply of second hand goods i.e. used goods as such or after such minor processing which does not change the nature of goods shall be the difference between the purchase price and the selling price, provided no input tax credit has been availed on purchase of such goods. However, if the selling price is less than purchase price, that negative value will be ignored. Persons who purchase second hand goods after payment of tax to supplier of such goods will be governed by this valuation rule only when they do not avail input tax credit on such input supply. If input tax credit is availed, then such supply will be governed by normal GST valuation. Value of supply of goods repossessed from a defaulting borrower. If the defaulting borrower is not a registered person, the purchase value will be purchase price in the hands of such borrower reduced by five percentage points for every quarter or part thereof, between the date of purchase and date of disposal by the person making such repossession. However, if the defaulting borrower is registered, the repossessing lender agency will discharge GST at the supply value without any reduction from actual/notional purchase value. The value of a token, or a voucher, or a coupon, or a stamp (other than postage stamp) which is redeemable against a supply of goods or services or both shall be equal to the money value of the goods or services or both redeemable against such token, voucher, coupon, or stamp. The taxable value is deemed to be Nil wherever input tax credit is available. (i) Construction of a complex, building, civil structure or a part thereof, including a complex or building intended for sale to a buyer, wholly or partly, except where the entire consideration has been received after issuance of completion certificate, where required, by the competent authority or after its first occupation, whichever is earlier. In case of supply of service mentioned above, involving transfer of property in land or undivided share of land, as the case may be, the value of supply of service and goods portion in such supply shall be equivalent to the total amount charged for such supply less the value of land or undivided share of land, as the case may be, and the value of land or undivided share of land, as the case may be, in such supply shall be deemed to be one third of the total amount charged for such supply. (b) amount charged for transfer of land or undivided share of land, as the case may be. Value of supply of lottery shall be 100/112 of the face value or the price notified in the Official Gazette by the organising State, whichever is higher, in case of lottery run by State Government and 100/128 of the face value or the price notified in the Official Gazette by the organising State, whichever is higher, in case of lottery authorised by State Government. The rate of exchange for determination of value of taxable goods or services or both shall be the applicable RBI reference rate for that currency on the date of time of supply as determined in terms of section 12 or section 13 of the CGST Act.